Provide captions for all videos so that they are accessible by persons with hearing impairment. Captions not only present the content of a conversation but also the important cues and surrounding noises. * To attain the Baseline level, mobile applications are required to adopt any of the best practices in 1.9, 1.10 and 1.11. 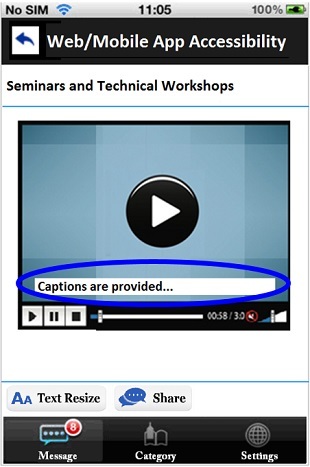 Captions as shown in the example above should be provided so that persons with hearing impairment can fully understand the content of the video.